We invite you and your family to experience the difference of personalized, friendly, and comprehensive medical care at Live Oak Family Health, PA. With years of experience caring for everything from minor problems to the most complex medical conditions at all stages of life, Dr. Sullivan and PA Samantha Gore and their staff look forward to making your family a part of ours. Same-Day Sick Visits, Immunizations, Wellness Exams for Women, Men and Children, Newborn Care, Medicare Annual Exams, Sports Physicals, Minor Dermatologic Procedures, Pulmonary Function Tests and EKGs, Osteopathic Manipulation for Acute & Chronic Pain, Diabetes, High Blood Pressure, and Other Chronic Illness, Nursing Home and Hospice Care. Live Oak Family Health, P.A. 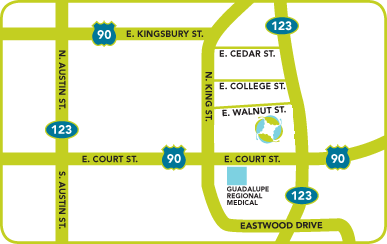 Located at King Plaza directly across the parking lot from King Ranger theater and HEB in Seguin.